Sustainable Maryland is a certification program for municipalities in Maryland that want to go green, save money and take steps to sustain their quality of life over the long term. Our mission is to assist municipalities in choosing a direction for their sustainability efforts, measure their progress, and gain recognition for their accomplishments. Sustainable Maryland is an initiative the Environmental Finance Center at the University of Maryland. In 2016, six new municipalities became Sustainable Maryland Certified, and eight municipalities became re-certified, for a total of 36 certified municipalities. In total, 67 municipalities are currently registered with the Sustainable Maryland program. Passed a backyard chicken ordinance, allowing residents to keep and maintain roosters on their property. Signed the Annapolis Renewable Energy Park (AREP) lease in 2015, starting the process of installing solar panels on 80 acres of closed landfill space. When completed, panels will produce 22 kWh of electricity/year, and will be the largest solar project exclusively installed on a closed landfill, per USEPA. Developed a Cultural Resource Hazard Mitigation Plan to identify and mitigate potential losses to historic sites due to natural disasters, sea-level rise, subsidence, and flooding. Worked closely with the Main Street Annapolis Partnership to strengthen and sustain local businesses. Designated a Tree City USA for the past 24 years. Held a GreenScape event each spring and fall, in which volunteers clean up and plant flower and vegetable gardens and public spaces throughout the City. In the past 10 years GreenScape volunteers have planted more than 15,000 perennials and 1,500 trees and shrubs. Adopted a Bicycle Master Plan in 2012 with the intent of earning the distinction of being a League of American Bicyclists “Bicycle Friendly Community”. Serves as host to two MD Green Schools: Bladensburg High School and Port Towns Elementary School, both designated in 2016. Supported the creation of a 40-tree edible forest by Bladensburg HS students for the purpose of providing fresh fruit to the local residents. Partnered with ECO City Farms to throw the Port Towns’ Food Day Celebration, at which over 500 people, many from the local community, participated in activities including dancing, planting seeds, picking pumpkins, and learning about healthy food. Helped ECO City Farms to create a youth garden with ten raised beds, at which students volunteer their time to plant, water, weed, and care for the beds, in exchange for the food grown and training in urban agriculture practices. Installed a solar array for town hall that reduced CO2 emissions by 23 tons per year, decreased energy demands by 5.997 MW annually, and dropped annual costs by more than $3,500. Installed 2 Eco-Poles at the Municipal Center; Eco-Poles are free-standing 60 Watt LED light poles that are powered by a wind turbine and photovoltaic solar panels. Purchased five new police vehicles with Eco-V* and 6-cylinder motors (more efficient than their previous V8 engines), which increased the fleet’s game mileage by about 3.5 miles/gallon for sedans and 6 MPG for SUVs. Purchased 11 solar-powered Big Belly trash compactors for use by the public, with the intent to reduce litter. Hosts 10 MD Green Schools; the Bowie Green Team has held two Green School forums since 2014. Operates a farmers' market in the parking lot of Bowie High School on Sundays from May to October, at which 18 vendors sell goods. Gross market sales are roughly $112,000/year. 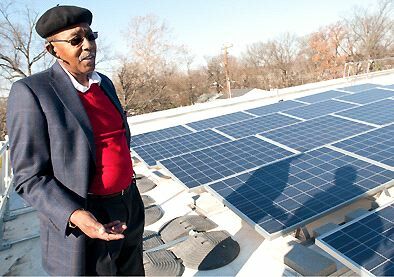 Supported the Bowie Solar Co-op for residential homes, which resulted in 50 residents installing solar panels. Bowie’s City Hall, built in 2014, is certified LEED Gold, with 42 LEED features incorporated into the building including a partial green roof, water-saving toilets, and reserved parking for low emission/hybrid vehicles. Purchased an all-electric Nissan Leaf and two electric motorcycles for the city’s fleet; Bowie’s police department is one of the first on the East Coast to use electric motorcycles. Completed an inventory and conditions rating of the City’s hiker-biker trail system, identifying trails in need of repairs or maintenance, as well as highlighting missing links in the existing trail network. Designated a Tree City USA for the past 23 years, indicating their meeting objectives in the planting, maintenance, and preservation of the urban forest. Hosts the Center for Young Children, a certified MD Green School. Planted 150 trees, shrubs, and various plants as part of the first phase of its Trolley Trail Forest Garden permaculture project along the city’s abandoned trolley line. Hosts a farmers’ market on Sundays from April to November in the City Hall parking lot. Launched the mBike bike-share program in partnership with the University of Maryland, that includes 14 stations, 120 bicycles and five accessible trikes. 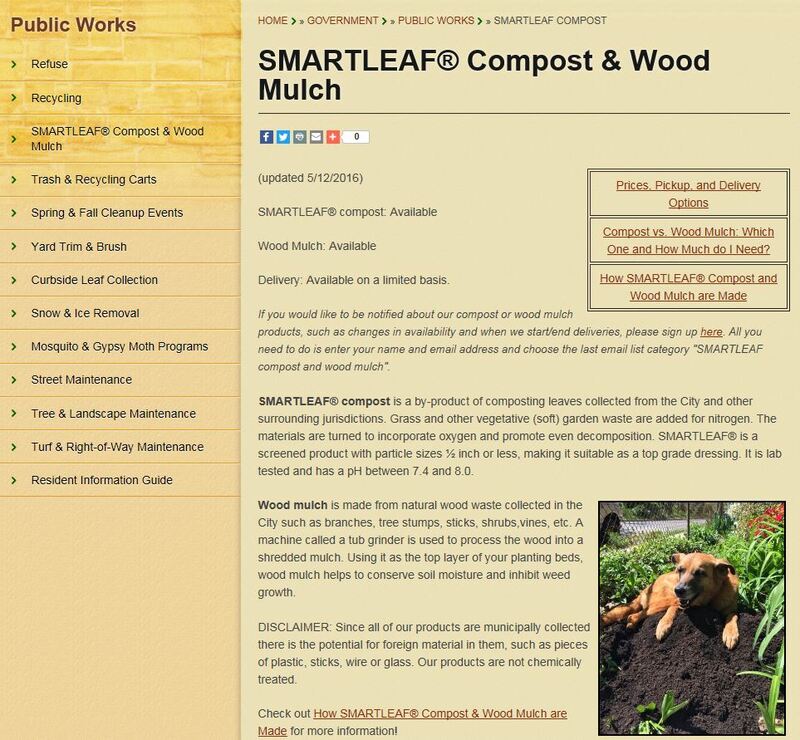 Operates a year-round SMARTLEAF® yard waste collection service that collects 1,500 tons of vegetation each year, diverting it from landfills and producing compost for its citizens. Designated a Tree City USA. Approved a “Complete and Green Streets” Policy in 2016 in an effort to minimize the environmental impact of the city’s roadways and promote safe access for all roadway users. Adopted a “bee-friendly” ordinance that restricts the use of pesticides within the town. Installed sixty 20-kilowatt solar panels on the community center’s roof, which reduces the building’s monthly energy use by 10%. Created and promoted a series of green business workshops for contractors and residents on the topics of installing pervious paving and rain gardens, and planting and maintaining fruit and nut trees. Adopted Sustainable Purchasing Policy to provide guidance for the purchase of municipal materials and services. Partnered with Eco City Farms to host a Local Food Fair that was attended by more than 600 people. Adopted a Green Purchasing Policy to provide guidance on the purchase of materials and services. Sponsored the development of 5 Little Free Libraries as part of a national program, providing free library books for residents to borrow and return. Planted and now maintains 3 public fruit orchards throughout the community, which will provide free fruit to residents once trees mature. Supports local farmers' market each Saturday from June to October. Entered into an agreement with Washington Gas to purchase 100% wind energy for the city’s 44 streetlights. Installed a 23000-kilowatt solar PV System to benefit Town Hall; cost savings are estimated at $42/month. Adopted a Green Purchasing Policy in order that all procurement decisions made embody the Town’s commitment to sustainability. Designated a Tree City USA since 2014. Hosts St. John Regional Catholic, a certified MD Green School. Passed an updated livestock ordinance, allowing up to six hens per private yard. Manageed a Community Garden Plot program since 2005, with over 60 plots available for rent by residents in two locations in the city. Matches grant funds received by the Downtown Frederick Partnership and the Golden Mile Alliance organizations to be used to improve small businesses’ facades. Passed a resolution giving preference to local businesses bidding on city projects. Coordinated the Algae Control on the Carroll Creek Project with students from Hood College in an effort to control the level of harmful and inaesthetic algal-growth in the manmade Carroll Creek. Designated a Tree City USA community since 2014. Implemented a stormwater management utility fee in 2013 for impervious surfaces; funds are used to help protect water resources. Adopted a resolution requiring LEED Green Building Silver certification for all future occupied municipal buildings. Adopted green building requirements for new development and substantially improved development. Specifically, commercial and high-rise buildings larger than 10,000 square feet but no larger than 50,000 square feet are required to achieve a LEED Green Building Certified-level rating. Created a Community Carbon Footprint report, which demonstrates a baseline of carbon emissions for the residential energy, commercial energy, industrial energy and transportation sectors. Adopted an innovative Environment and Sustainability Plan as part of the City’s Comprehensive Plan. Entered into a group purchasing agreement to purchase Renewable Energy Credits to offset 100% of the City’s energy usage. Hosts an annual Environmental Awards Program with the purpose of publicizing good environmental practices and inspiring others to improve practices in the future. The awards are open to any citizen, business, or organization based within the City limits. Promotes the Rainscapes Rewards program to help residential property owners improve stormwater runoff conditions on their property by installing more natural drainage projects. Home to 2 Maryland Green Schools: Summit Hall Elementary School and Gaithersburg Elementary School. Established the City’s first food forest in 2016. More than 50 volunteers participated in preparing and planting the site on Emerson Street, which will grow apples, pomegranates, pears, berries, plums and nuts, amongst others, providing a critical green link in a neighborhood lacking open space. Installed anti-idling devices on six police vehicles, which save fuel and reduce emissions by shutting off the engine while parked, but still allowing use of auxiliary equipment such as lights, computers, and radio. Adopted a Sustainable Land and Building Management Policy, aimed at eliminating the use of toxic pesticides on City-owned property and buildings. Initiated a Backyard Composting pilot program, providing more than 60 households with a free compost bin in its first year. Adopted a Green Streets Policy, which ensures that low-impact design is utilized in the stormwater and transportation elements of any redevelopment projects. Hosted the Hyattsville Farmers Market for the 25th consecutive year, which features free cooking and yoga classes and provides low-income families with $10 “money-matching” coupons for use at the market. Installed an innovative “White Roof” on the City’s municipal building, which helps to reflect the sun and reduce the temperature of the building, and thereby reduce the electricity bills from air conditioning. Purchased three neighborhood electric vehicles for the City’s code enforcement staff, which helps improve local air quality and reduce fuel consumption. Designated a Tree City USA for the past 25 years for tree-friendly actions including the ongoing development of a tree inventory, which will identify, geolocate, and categorize the health of all trees located within the public right-of-way. Purchased two neighborhood electric vehicles for its municipal fleet, helping to lower fuel costs and reduce air pollution and greenhouse gas emissions. Provides free compost to residents through the recycling of biosolids generated at the wastewater treatment plant. Hosts two Maryland Green Schools: Havre de Grace High School and Meadowvale Elementary School. Hosts a local Farmers’ Market from May through November, with more than ten vendors selling their produce rain or shine, thanks to a new 40-foot by 40-foot tent erected in Hutchins Park. Established a Community Garden initiative in 2012 with a pilot garden located on Market Street, and expanded in 2013 to three more sites at Market Street #2, Seneca Avenue, and the Old Reservoir, thereby providing convenient access to garden plots throughout the City. Designated a Tree City USA for the past 14 years, with the Tree Commission overseeing the community forestry program and annual Arbor Day celebration. Created a network of walking trails throughout the city, which are promoted through an online self-guided tour, that help to foster both increased fitness amongst residents as well as greater appreciation of the City’s natural and historic resources. Utilizing a Power Purchase Agreement, constructed a 836-kilowatt solar array directly adjacent to the East Wastewater Treatment Plant, which delivers 1,143 megawatts of electricity annually to fully power Middletown’s water and wastewater facilities. Upgraded 65 existing light fixtures in the Municipal Center to energy efficient 14-watt LED bulbs. Inaugurated Middletown’s first Green Expo in 2016 in Middletown Memorial Park, with more than 300 attendees browsing exhibits and demonstrations on a variety of environmental topics. Hosts the volunteer-run Middletown Food Bank, which provides reliable access to nutritious food to thousands of families in the Greater Middletown area. Instituted a Workplace Wellness program for employees, including free gym memberships and a walking challenge with performance-based awards. Published “Maintaining and Sustaining Our Architectural Heritage”, an architectural history of the town that also has a question-driven worksheet that allows property owners to identify the character-defining features of their property, and thus better maintain their historic homes and the sense of place they create in the community. Completed a Municipal Carbon Footprint for the Town in 2015. Designated a 2015 Tree City USA, which recognized the Town for meeting the program’s four requirements: a tree board, a tree care ordinance, an annual community forest budget of at least $2 per capita, and an Arbor Day observation and proclamation. Developed a Homeowner’s Guide to the Coastal Bays, including topics such as Green Gardening and Native Planting, recycling rules, and healthy housekeeping practices. Conducted energy audits on a dozen town buildings in 2015. Established a volunteer-based Dune Patrol, where residents clean and inspect their local dunes year-round and are part of biannual beach clean-ups. Provides free Wi-Fi in the Downtown Plaza area to encourage more economic activity at local merchants. Home to two Maryland Green Schools: The Salisbury School and Wicomico Day School. Initiated the replacement of 117 existing street lights with LED lights. Established a Stormwater Utility to fund improvements to the existing storm drain system and projects which will improve overall water quality. Converted 5,000 square feet of asphalt parking lot to a bio-retention area. Created the Salisbury Downtown Walking Route, which offers a signposted and mile-marked fitness trail for residents and downtown employees to utilize, as well as a tourist-oriented attraction for visitors. Achieved League of American Bicyclist “Bicycle Friendly City” Bronze Designation in 2015 for its Bicycle & Pedestrian Advisory Committee -led efforts to create a Biking & Hiking Master Plan, conduct walkability workshops, and install new bicycle infrastructure throughout the City. Adopted a Sustainable Procurement Policy in 2016 that ensures that town staff considers sustainability when purchasing products and/or services to be utilized within the town’s operations. Implemented an LED street light retrofit program in 2015, which has thus far installed 62 new downtown LED street lights and 30 new subdivision LED street lights. Hosts a Farmers' Market that has been active since 2005. 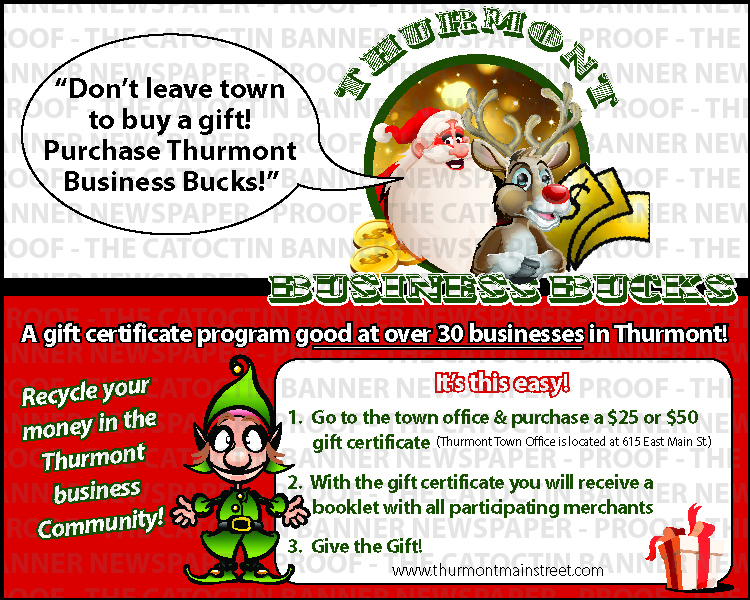 Promotes “Thurmont Business Bucks” as part of a “Buy Local” campaign. This program allows residents to purchase “coupons” that can be used at any participating business in town, keeping more money circulating locally. An average of 320 households made up of over 1,300 individuals receive food each month from the Thurmont Food Bank. Established a Traditional Neighborhood Development (TND) Ordinance, which details specific characteristics that must be met including building design, street alignments and design, and architectural details. Sustainable Maryland hosted three Leadership Training Workshops in November 2016 on the topic of Sustainability Metrics: Measuring What Matters. Workshops were held in Cambridge, Hyattsville and Hagerstown, with more than 90 elected officials, municipal staff and Green Team members attending. Sustainable Maryland hosted our second Prince George's County Green Team Summit in February 2016. Representatives from fifteen municipal Green Teams attended. Sustainable Maryland staff conducted five Wednesday Webinars in March and April 2016 on a variety of topics, including backyard composting, growing a food forest, residential solar in Maryland, how to develop a SM Action Plan, and tips for successful SM certification application. Sustainable Maryland staff conducted customized training sessions for more than a dozen Green Teams across the state, providing a information on completing Action Plans and formulating specific strategies for achieving local sustainability goals. For more information on Sustainable Maryland programs, as well as other sustainability-related events across Maryland, please check out our Calendar of Events.